Oh, glorious Venus! How fragrant are your sulphuric skies! How your rainbow clouds do shimmer! The atmosphere of Venus is thought to contain droplets rich in sulphuric acid. By imaging the clouds with the Sun directly behind the Venus Express spacecraft, scientists hoped to spot a glory in order to determine important characteristics of the cloud droplets. They were successful. The glory in the images here was seen at the Venus cloud tops, 70 km above the planet’s surface, on 24 July 2011. It is 1200 km wide as seen from the spacecraft, 6000 km away. See a glory observed by a NASA Earth-orbiting satellite here. From these observations, the cloud particles are estimated to be 1.2 micrometres across, roughly a fiftieth of the width of a human hair. The fact that the glory is 1200 km wide means that the particles at the cloud tops are uniform on this scale at least. The variations of brightness of the rings of the observed glory is different than that expected from clouds of only sulphuric acid mixed with water, suggesting that other chemistry may be at play. 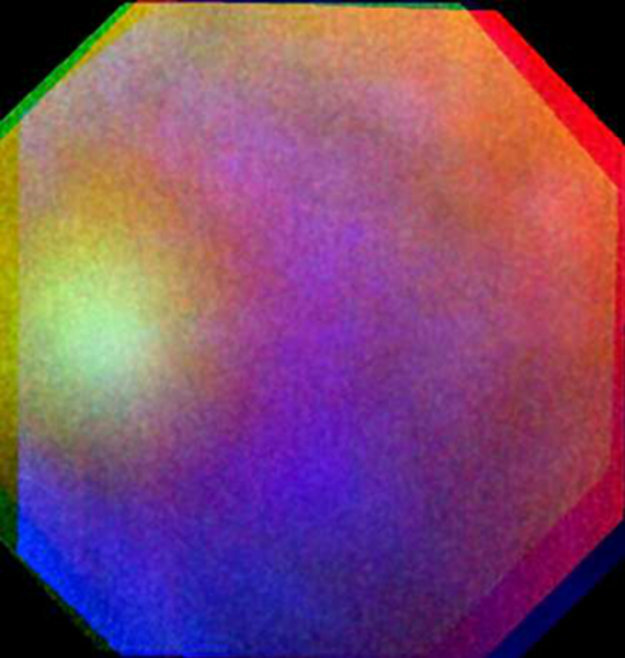 One idea is that the cause is the “UV-absorber”, an unknown atmospheric component responsible for mysterious dark markings seen in the cloud tops of Venus at ultraviolet wavelengths. More investigation is needed to draw a firm conclusion. Next Post How Does NASA Change a Spacecraft’s Orbit? Easy as Pi.